Description: Learn how to apply the concept of cross contour lines to shading using hatching and cross hatching. 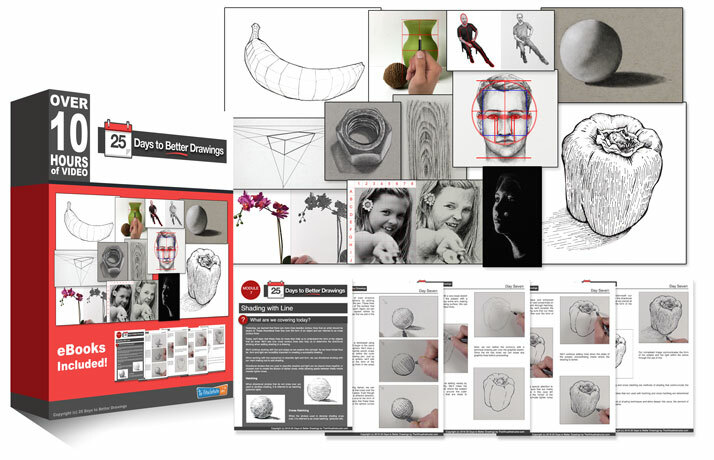 Suggested Materials: Graphite drawing pencil, white drawing paper, technical drawing pens, and a kneaded eraser. The rest of my drawing looked okay. Ellipses are difficult. It takes a little practice, but they’ll always be challenging – perhaps the most challenging shape to capture. Agreed! Ellipses and cross-hatching ended up being much more difficult than I would have thought. What I love about this series is it doesn’t take anything it teaches for granted–the fundamentals are so clearly explained without being condescending or glossed over. I’ve heard of all these concepts before but I finally feel like they’re coming together for the first time instead of pieced together from some draw-a-picture-in-five-easy-steps manual or from the tips on the back of a colored pencil box. Thanks again! Wauw, a bit more difficult with the inkt pen but interesting. I need to be carefull to keep looking to the example instead of Matt’s drawing, because it’s easier to replicatie from a drawing than from an object. So now and then I try to stop the video in order to only concentrate on the object. Looking forward to the next days! thanks matt! I think this is my first successful cross hatching. Because This is the first time I actually knew what I was doing while I was drawing and not expecting some artistic intuition from nowhere. I’m really happy with my drawing! Hello Matt – just so appreciate your emphasis on line. I enjoy the clarity and precise effect of pen drawing. Such a pleasure. hello again – have completed my capsicum drawing – i found the hatching for form a little challenging as I usually draw with graphite tona variation to do this. But I like the different outcome. This was an excellent lesson. Your instructions were very clear and this lesson combined with the contours lesson really gave me a good understanding of how to place the hatching. Thank you!